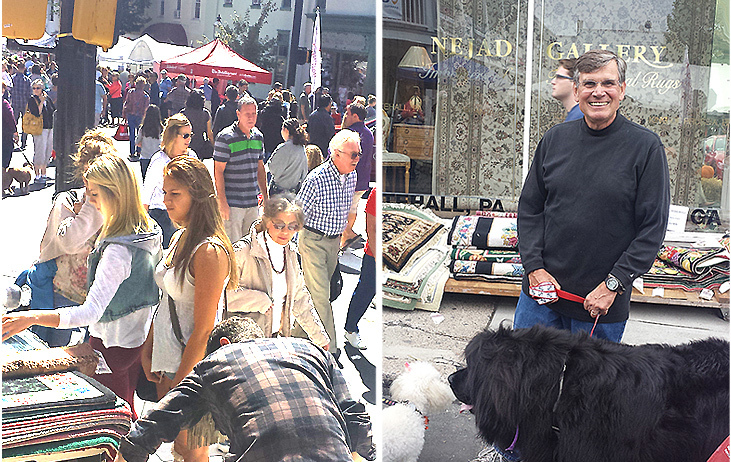 Featuring over 150 Vendors, live music, food court, family activities and a multi-town Bike Race, the 23rd annual Doylestown Arts Festival held on Sept. 13 & 14 was a great way to celebrate the incoming fall season and to enjoy the final warm days of summer. 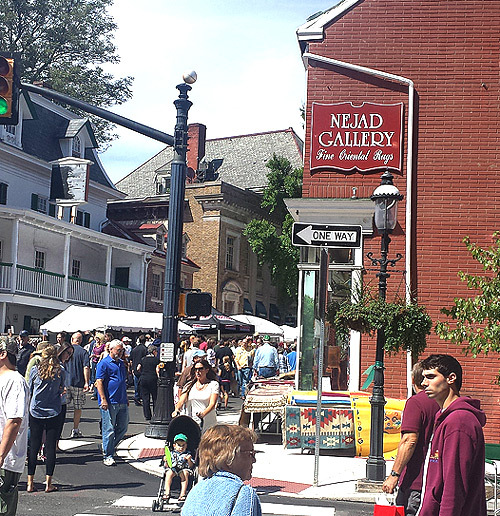 The event, a two-day juried festival of local Bucks County artists, was held outdoors in the heart of beautiful Doylestown, spanning State, Main, W Oakland and Hamilton Streets – and putting Nejad Rugs Gallery Showroom at the hub of the activity. Some of the rugs on display in front of the Nejad showroom ( see photo – inset ) included Southwestern Rugs, Bright Rugs and Bucks County Hook Rug Collections – some of the more festive and colorful-themed rugs in the Nejad vast inventory of rug styles. Nejad Rugs has long been an established retail business serving Doylestown and the surrounding Bucks County communities from the same location at the corner of Main and State. From the vintage hand-gilded gold-leaf lettering on the Nejad display windows to the informal yet elegant 2-story showroom interior to the Nejad full-service customer approach this is a business that has a genuine organic quality and feel to the brick and mortar. Come in and browse the rugs on display in a relaxed and comfortable showroom setting – business hours are Tuesday through Saturday 10AM – 5PM and Sundays 12PM – 5PM, Monday and evenings by appointment. Besides the area rugs on display some of the items being offered by the array of vendors included handmade soaps, candles, hardwood furniture, stained glass panels, jewelry, handbags, clothing, photographs and much more. The event also featured the Thompson Bucks County Classic, the second annual bike race from the borough of New Hope all the way to the festivities of the Doylestown Arts Festival. Of course it was a great opportunity for local artists to display and sell their artworks and the turnout was impressive – the weather made to order – and Bucks County’s largest event of the year was, decidedly, a success. This entry was posted in Doylestown and tagged business hours are Tuesday through Saturday 10AM - 5PM and Sundays 12PM - 5PM, informal yet elegant 2-story Doylestown rug showroom, Monday and evenings by appointment, Nejad Rugs has long been an established retail business serving Doylestown and the surrounding Bucks County communities by Theresa Nejad. Bookmark the permalink.